Personalize your own Roll Up Banners and Stand Up Banners! 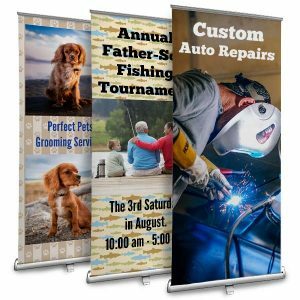 Self Standing banners that include all the hardware needed to make your banner stand on it’s own. Add photos and text and create a banner whatever the occasion is. 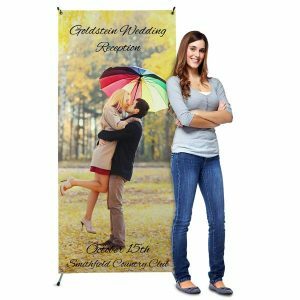 Stand up banners are great for Parties, Events, Weddings, Retail Stores, Restaurants, trade shows and more! With graduation right around the corner, it’s time to start thinking about banners! Our stand up banners are ideal for display both indoors and outdoors. Whether you’re having your graduation celebration in your back yard or at a party rental venue, you can create custom graduation banners that compliment the occasion! Choose your graduating senior’s best photos and use them to create a collage on our stand up banner to liven up the party with personality! Take a look at our Roll Up Banners and Stand Up Banners now!